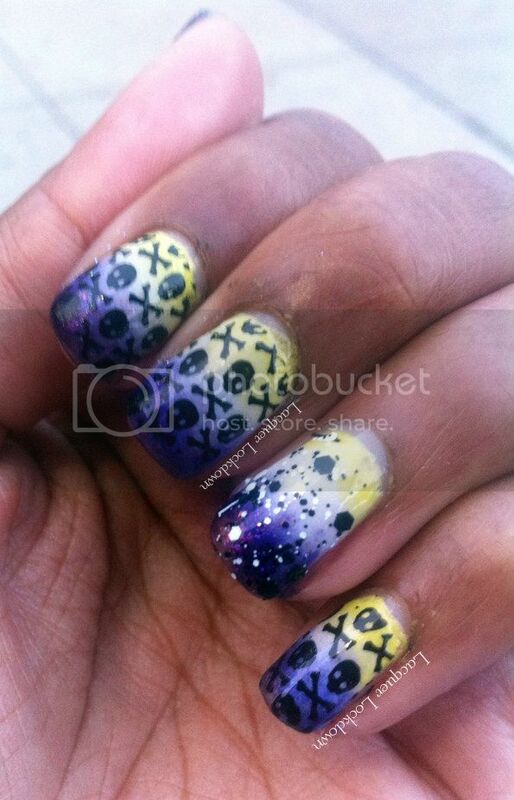 Lacquer Lockdown: Skulls and Crossbones Oh My...On Sundays I Stamp! Omo you thought I stopped stamping on Sundays huh? Well truth be told sometimes AIS was hard to do when I had to get my Time Warp challenges up, but the warp has ended and here I am reunited and it feels so good ;) But I will say this now yesterday's mani made me want to go very simple today in terms of stamping. The theme for this weeks challenge was to do an invasion of...whatever our hearts desired. I chose skulls and crossbones because I wanted to stay on theme for Halloween and because I have lots of plates with skulls and crossbones. So let's get onto the art yes? I wanted to use lots of different stamps to create this mani unfortunately it didn't quite work out the way I wanted it to when I was stamping so I chose to stick with one plate. However I have to say I love the overall results! Notice how once again I snuck in some of my beloved black and white glitter? Hehe this time the lucky winner is Samurai Princess by Sonnetarium. She's quite the talented little medhead eh? You can find her polishes here and keep updated on her Facebook page. And as always you know I love my Vivid Lacquer plates! They can be found here. I mean, I really wish I could favorite a post. Voted for ur amazing entry! OMG! 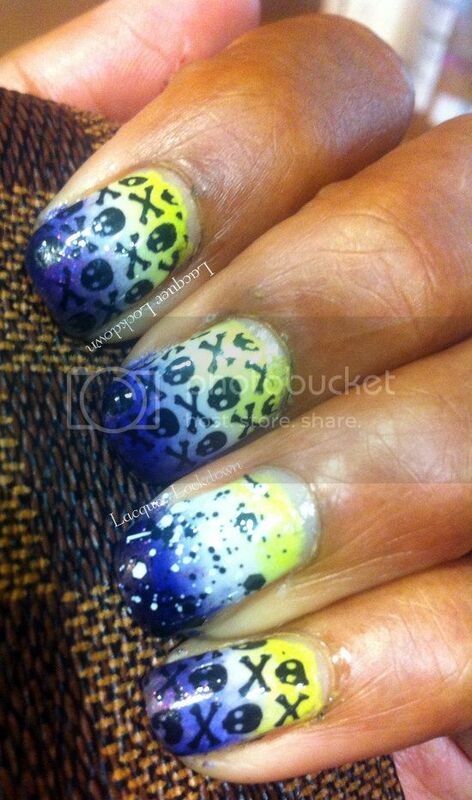 Ur Halloween themed nails are super nice! So like the color combos U use! And thanQ very much for support! That girl is just "OFF" for me right now! Thank you as always darling! I replied to this so long ago but it didn't record maybe because I did it from my blogger app??? Gurl please you know I wouldn't hold it against you even if you didn't comment! Thank you though lovie! Cute!! Your gradient is gorgeous!